The telematic dress project began at Nottingham-Trent University’s DAP lab as an exploration into the development of performative fashion and the sharing these garments across distance. The Arizona State University team joined the project in the fall of 2004 with an interest in exploring shared telematic space and ultimately the notion performers cooperatively embodying remote spaces. 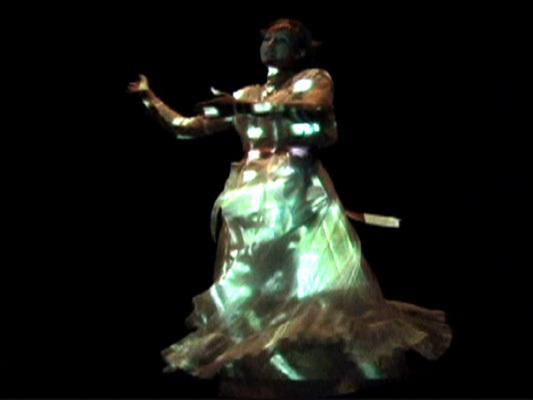 The concept on an evolving garment design that is materialized (moved) in live performance originates from DAP Lab’s experimentation with telematics and distributed media (http://art.ntu.ac. uk/performance_research/birringer/dap.htm) addressing “connective tissues” through a study of perception/proprioception in the wearer (tactile sensory processing) and the dancer/designer/viewer relationship. This study is conducted as cross-cultural communication with online performance partners in Europe, the US, Brazil and Japan. The inter-active space is predicated on transcultural questions: how does the movement with an evolving design and wearable interactive sensors travel, how does movement – and capturing of movement – allow the design to emerge toward a garment statement, and how are bodies-in-relation-to sensory fabrics affected by the multidimensional kinesthetics of a media-rich, responsive environment. We don’t often see much come out of Nottingham-Trent University related to networks and performance which is a surprise when you consider that Stelarc has been a Principal Research Fellow in the Performance Arts Digital Research Unit there for a number of years. Other works with Telematic in the title include; Telematic Vision and Telematic Encounter by Paul Sermon and Telegarden (close enough) by Ken Goldberg. Originally seen at Networked Performance and Architectradure. RSS feed for Comments / Pings on this post. Don't know what this is? Click here. This is a QR Code, it's a printed link to this webpage on Network Research! and download a reader application for your mobile device. Garrett Lynch 2019 and licensed under a Creative Commons Attribution-ShareAlike 3.0 License.